John Leslie Montgomery got the name Wes when he was a teenager; it's a corruption of his middle name. Born on 6 March 1923 in Indianapolis, Wes followed in the footsteps of his bass playing older brother, Monk, and took up the six-string guitar when he was twenty, having played a four-string guitar since he was twelve; later their piano and vibes playing younger brother, Buddy, joined the family of musicians. He learned the guitar from listening to Charlie Christian records, he was note perfect on his hero's solos, and also taught himself to read music. After a spell playing in local bands he joined Lionel Hampton's orchestra in July 1948 and spent the next eighteen months touring and recording with the band. After Montgomery quit Hampton's band in January 1950 he went back to Indianapolis and nothing more was heard from him musically until 1955, and then just one session for Columbia. In 1957 the three brothers and trumpeter Freddie Hubbard recorded together. For the next two years the Montgomery Brothers recorded for World Pacific Jazz and Wes in particular began to build a reputation as a gifted guitarist. In October 1959 the Wes Montgomery Trio recorded for the Riverside label in New York City and over the next year or so, as well as recording under his own name, Wes worked in the studio with singer Jon Hendricks, trumpeter Nat Adderley, saxophonists Harold Land and Cannonball Adderley, John Coltrane, George Shearing, Milt Jackson as well as a number of sessions with his brothers. In the Downbeat poll for best guitarist he was pre-eminent from this time onwards; his much loved, unique, tone was in part derived from using his thumb rather than a plectrum. 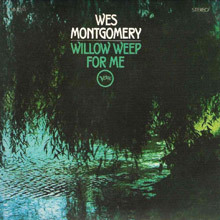 Montgomery's work is characterised by the way he built his solos from the melodies. His original imagination created seemingly simple solos that often surprises the listener but always felt just right. From 1962 he recorded mostly under his own name for the Riverside label and recorded some acclaimed albums including The Incredible Jazz Guitar of Wes Montgomery in 1960 with pianist Tommy Flanagan, bassist Percy Heath and drummer Albert 'Tootie' Heath. It features two of Montgomery's best-known compositions, 'Four on Six' and 'West Coast Blues.' He was signed by Verve late in 1964 and his first sessions with Johnny Pate's orchestra in November produced the album, Movin' Wes. In March 1965 he recorded with Don Sebesky's Orchestra at Rudy Van Gelder's studio and the tracks made up the album Bumpin' becoming the first of his ten albums to make the Billboard Pop charts. The album proved difficult for Montgomery to make as when he was recording with the full orchestra he was unable to get the results he wanted. Sebesky came up with the idea of Montgomery recording with a small group to which orchestral overlays were added. 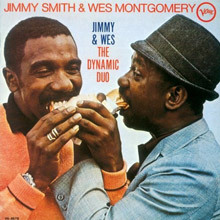 Over the next three years Wes was rarely off the charts with albums including Tequila (1966), arranged by Claus Ogerman, California Dreaming (1967) and Jimmy & Wes The Dynamic Duo, an album recorded with Jimmy Smith. 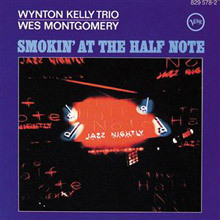 One of his most appreciated Verve albums is Smokin' at the Half Note (1965) that was recorded at the New York City club with the Wynton Kelly Trio. Although both this and his Further Adventures of Jimmy and Wes failed to chart they are fine albums and certainly at the jazzier end of the spectrum, which may well account for their lower sales. Both these albums are representative of Montgomery's club appearances throughout his career when he played in small group settings rather than the orchestral accompaniment that he so often appeared with on record. In late 1967 Montgomery signed for Creed Taylor's CTI Records, a subsidiary of A&M Records, and had his most successful record on the Billboard charts when A Day In The Life reached No.13 and stayed on the charts for well over a year on its way to becoming the best selling jazz album of 1967. On 15 June 1968, just a month after his last ever recording session for A&M, and shortly after returning from a tour with his quartet, Montgomery woke up feeling unwell; within minutes he had a heart attack and died instantly. He was forty-five years old and at the peak of both his fame and success. Montgomery's influence on jazz guitar cannot be understated. Joe Pass said, "To me, there have been only three real innovators on the guitar—Wes Montgomery, Charlie Christian, and Django Reinhardt." It is not just jazz guitarists that recognise Montgomery's talent, among the rock fraternity; Stevie Ray Vaughan, Joe Satriani and Jimi Hendrix have all acknowledged his influence. Lee Ritenour, who recorded the 1992 album Wes Bound, also named his son Wesley. Smokin' at the Half Note is essential listening for anyone who wants to hear why Montgomery's dynamic live shows were considered the pinnacle of his brilliant and incredibly influential guitar playing. Pat Metheny calls this "the absolute greatest jazz guitar album ever made," and with performances of this caliber ("Unit 7" boasts one of the greatest guitar solos ever recorded) his statement is easily validated. Montgomery never played with more drive and confidence, and he's supported every step of the way by a genuinely smokin' Wynton Kelly Trio. In 1998, Verve reissued the complete show on disc two of Impressions: The Verve Jazz Sides, although the scrambled track order and some non-essential cuts don't diminish the appeal of the original album. Taking the listener on a smoother, rather than bumpier, ride down the moonlight highway of jazz is Wes Montgomery, a chief architect of the world's guitar virtuoso scene. Not only is his brilliant command of the six-string present here, so is the vivid color tones of notes and blue notes played between. Backed up by a hauntingly beautiful and mesmerizing orchestra conducted and arranged by Don Sebesky, the music almost lifts the listener off his feet into a dreamy, water-like landscape. The atmosphere is serene and enchanting, such as a romantic evening for two under starlight, and certainly a romantic eve merits the accompaniment of this record. The sounds are soft, smooth, and silky, and Montgomery addresses full leadership of his graceful melodic style, fronting close to 20 members of a orchestra perhaps best described resonant and sweeping. So too are the sweeping note flows of Montgomery's guitar, and his surprising fluidness towards the art of comping, a necessary trait of the jazz guitar virtuoso. Even the unforgettable Jim Hall can be tickled and intrigued through a listen of these influential records, as for all amateur and professional guitar musicians. "A Quiet Thing" is perhaps the most somber, peaceful, and smooth piece on the record, demonstrating Montgomery's love of quiet, and how much the idea of not playing at all brings music to the listeners. The charming sounds of orchestral violas, violins, cellos, and harp are sent ablaze to create a pleasant atmosphere, either for a quick morning get up, get ready for work, or evening dining setting. "Here's That Rainy Day" is an up-tempo bossa nova tune that resonates with Montgomery's enticing chordal changes and blissful phrasing, not to mention the blend of harp and strings lays the groundwork for a perfect rainy day inside, with drops pattering at the windows and fires aglow. The recording engineer did a wonderful job with this album. The sound quality is clear and lush, and, overall, this collection of mid-'60s cool jazz is a delight to listen too, once and again. 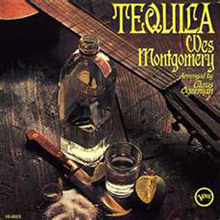 On two of the songs included on Tequila, "Tequila" and "The Thumb," Wes Montgomery had an opportunity to jam a bit while backed just by bassist Ron Carter, drummer Grady Tate and the congas of Ray Barretto. The other six selections utilize a string section arranged by Claus Ogerman but, even with a throwaway version of "What the World Needs Now Is Love," there are memorable renditions of "Bumpin' on Sunset" and "Insensatez" that uplift this album quite a bit beyond the guitarist's later A&amp;M recordings. 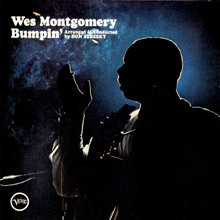 Wes Montgomery’s 1966 offering for Verve is anchored by two of the era’s most ubiquitous pop hits: Bobby Hebb’s “Sunny” and the Mamas & The Papas’ “California Dreaming.” Backed by orchestral arrangements by Don Sebesky, the songs showcase Montgomery’s wondrous tone. While purists whined that Montgomery wasn’t improvising like he did in the Riverside years, they missed the fact that simplicity can be the essence of maturity. Like a great singer, Montgomery didn’t need to use flurries of notes when he could make his statement with just a few. His mature tone brings depth to the tunes, even when he is only iterating the melody. California Dreaming provides moments of sublime delicacy — just witness the thumbed chords that Montgomery employs to guide “Winds of Barcelona,” or the gentle octaves he brings to “Sun Down.” Deepened by contributions from Herbie Hancock, Bucky Pizzarelli and Ray Barretto, this album provides a well of sophistication, even if you have to look beyond the album’s pop guise to find it. 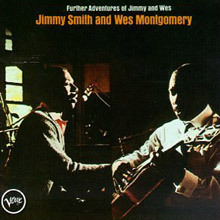 Further Adventures of Jimmy and Wes picks up where Dynamic Duo left off, digging a little further into the one-time-only Wes Montgomery/Jimmy Smith sessions and coming up with more fine music -- mellower in general than Dynamic Duo but first-class nonetheless. 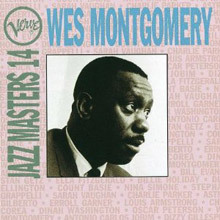 Unlike most of the studio sessions from this time, Montgomery gets plenty of room for his single-string work as well as his famous octaves, and both techniques find him in full, mature bloom, needing fewer notes in which to say more (Smith, of course, is precisely the opposite). All but one of the tracks on the original LP find Smith and Montgomery interacting only with themselves, the drums of Grady Tate, and the congas of Ray Barretto; Roger Miller's "King of the Road" (not often covered by jazzers) and Montgomery's "O.G.D." (later known as "Road Song") come off best. Oliver Nelson's big band makes a sole appearance with a swaggering chart of "Milestones." Though Dynamic Duo is probably the priority purchase by a hairsbreadth margin, you'll need to have both that album and Further Adventures eventually. Creed Taylor matched two of his most famous artists, Wes Montgomery and Jimmy Smith, on this session (Montgomery's last for Verve), and the results are incendiary -- a near-ideal meeting of yin and yang. Smith comes at your throat with his big attacks and blues runs while Montgomery responds with rounder, smoother octaves and single notes that still convey much heat. They are an amazing pair, complementing each other, driving each other, using their bop and blues taproots to fuse together a sound. The romping, aggressive big band charts -- Oliver Nelson at his best -- on "Down by the Riverside" and "Night Train," and the pungently haunting chart for Gary McFarland's "13" (Death March)" still leave plenty of room for the soloists to stretch out. "James and Wes" and "Baby, It's Cold Outside" include drummer Grady Tate and conguero Ray Barretto, with Smith's own feet working the organ pedals. The Verve Master Edition reissue also includes an alternate take of "O.G.D." with Tate and Barretto, a track previously surfacing on a long-gone Encyclopedia of Jazz anthology LP from the '60s -- a neat bonus that makes this the preferred version. Shortly after Wes Montgomery's shockingly early death, Verve rummaged around in the vaults and came up with some additional tapes from the live Smokin' at the Half Note sessions with the Kind of Blue rhythm section, Wynton Kelly, Paul Chambers, and Jimmy Cobb. And then after-the-fact producer Esmond Edwards did a controversial thing -- he commissioned Claus Ogerman, the arranger on Tequila, to overdub wind and brass arrangements on four tracks: the title tune, "Portrait of Jennie," "Oh! You Crazy Moon," and "Misty." The critics promptly pounced on Verve, NARAS responded by giving the album a Grammy, and the whole issue became moot when subsequent reissues of the four tracks erased the new backing charts. Yet on the whole, Ogerman did a good job; his arrangements are subtle and, in the case of the title track, swinging, with the flutes adding effective responses within Montgomery's statements of the theme. "Impressions," oddly enough, was left alone -- perhaps due to its lightning tempo -- and this classic solo has since been reissued many times as the prime example of Montgomery in his Verve period. "Surrey with the Fringe on Top" and an alternate take of "Four on Six" (with a bad edit cutting off Kelly's solo in mid-flight) are also free of orchestrations. In any case, what you will hear, bathed in winds or not, is prime, mature Wes Montgomery stretching out in full, with unbelievable confidence in his ear and technique at all times, experimenting now and then with mild electronic effects devices.